In a little over 24 hours from now, most of the world will either have begun, or started preparing to celebrate the come of the new year. For no other than organizational and rather arbitrary reasons, most of humanity has deemed tomorrow an important day—the gateway to another year. Of course, time doesn't really care what us puny humans call it, it just exists regardless of what we do or don't do. But for civilization, it's more than a random cause for celebration—it's also time for retrospection and strategizing for the future. 2015 was many things in the domain of mobile tech, and we've done our fair share of reflection on the topic already. We trust many of you also have, at least to an extent. And so while we're still all in a retrospective mood, we thought it'd be a good idea (and kind of fun) to waddle through the many surveys we staged in 2015, shortlist a few of the most popular ones, and bring them under one roof for you to skim through whilst obsessing over your New Year's Eve outfit in the back of your head. Which maker should make the 2015 Nexus? In mid-August, we thought it's high time we followed up on our 2014 census and take a head count again to establish which the most popular brands are among our viewers. Thanks to the some 6,700 readers who took part in the survey, we were able to draw some conclusions about the brands of devices our audience is split between. As you can see for yourself, with over 27%, Samsung is the indisputable leader, followed by Sony, LG, and Apple, all three of which are pretty much tied. Interestingly, there didn't seem to be much of a difference between the 2014 & 2015 numbers, suggesting that there's been no seismic shift in the popularity of any one maker. Just some two short months ago, we got curious about our readers' individual history of mobile devices. We wondered, which was your very first phone, and who manufactured it, knowing full well that Nokia was pretty much guaranteed to grab most of the votes. We weren't disappointed. With the lion's share of nearly 42%, Nokia ranked first, followed by Samsung (~10%), Motorola (~9%), and Sony Ericsson (~8%). Stark contrast to today, right? Given the results from the previous poll we showed you, it shouldn't be surprising to find out that most folks' (~47%) first smartphone ran a version of Nokia's Symbian OS. A distant second, Android only accounts for ~21% of people's first smartphone purchase, followed by Windows Mobile/Phone with ~12% and BlackBerry with ~5%. Every year, the rumor mill starts spinning mercilessly when the upcoming Nexus refresh enters the public's mind. Given the uniqueness of the program—in that Google selects one of a number of Android makers to manufacture its next 'reference' device—the topic of who the honor should go to this time around always draws a lot of attention. 2015 was no different, though back in the beginning of it, we didn't know that Google was actually planning to go for two devices this time around. In any case, Sony—which hasn't yet produced a single Nexus— proved to be our community's favorite, with over 30% of the votes, followed by HTC, Samsung, and LG. 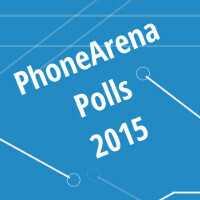 Huawei, which ended up manufacturing the Nexus 6P, received almost no votes. Funny how things work out, no? Speaking of the Huawei-made Nexus 6P, a little over a month ago we pitted it against the Samsung Galaxy Note 5 and let you be the judge. Seeing as how both these phablets ended up on ours (and yours!) Awards list for 2015, it makes sense that we included the results. As you can well see for yourself, the Galaxy Note 5 snagged most of the votes, though it appears that not everyone is much of a TouchWiz fan and many would rather have unadulterated, stock Android. When Samsung first showed the Galaxy S5 to the public, it probably didn't expect the indifference it was met with. To this date, the Galaxy S5 is probably the one Galaxy flagship to receive as much criticism for its uninspired design. Rival manufacturers chimed in, too, comparing the dotted back to a generic, 'breathable' band-aid, and it seems most of our readers agreed that Samsung did a shoddy job. That much is clear from the results of our poll, asking you to select your favorite Galaxy flagship in terms of design, whilst keeping in mind their respective release window (tastes change over time). Unsurprisingly, the Galaxy S6 and S6 edge took the gold, followed by the now dated Galaxy S II. Only 4.7% of voters thought the Galaxy S5 looked cool. Software version fragmentation is nothing new in Android world, and while it poses all kinds of serious problems to developers and users, it's also what made the cheap, but good, smartphones of today possible. We owe this variety to Android's open nature. Of course, with that already done, it's still kind of hard for most of us to swallow the reality of belated (or non-existent) software updates. 20 days ago, we asked you to mark the Android version you're currently on, and the vast, vast majority (over 65%) said they've got Lollipop already. That's actually a pretty great showing, as the global reading for that same period is <30%. More than anything, this is indicative that most of our readers are using up-to-date devices that either shipped with Lollipop on board, or were high-end enough to be a first priority for their respective manufacturer. Still, with a share of just 16%, Android 6.0 Marshmallow still is a rarity, even among our readers. Cupcake, Donut, Eclair, Froyo, Gingerbread, Honeycomb, Ice Cream Sandwich, Jelly Bean, Lollipop, Marshmallow. Other than these being names of major Android version releases, do you notice anything else? They're in alphabetical order, silly, and they're all names of sweets! So we know that come 2016, Google will be thinking of a dessert starting with 'N'. Given one major update per year, however, Google will run out of alphabet by 2028, meaning at some point in the future it will have to decide what to do after Android Z(eppole?). We asked you to weigh in and most of you were in agreement that Google will switch to another naming scheme altogether. Something cosmic, perhaps? That'd be cool. Only if Google can get all this feedback. After Android Zeppole, the fruit naming convention starting with Android Apple! Can't wait for the comments section when that time comes! Hopefully by then Apple will have been reduced to a has-been company in the mobile area that relied too much on its past achievements. Well Apple is like a cancer to competition. They're meant to compete to create the better product, but instead they just abuse the broken patent system and stifle the competition with stupid lawsuits based on false patents, as they sell overpriced devices. Loosing the cancer won't be a downgrade in competition. If it weren't for Apple, we wouldn't see the cutting-edge hardware and software refinements being put out on Android. Sure, they have tried stifling some of the competition, namely Samsung, but they also drove them and other manufacturers to up the ante on hardware and software quality over the years. That's just false. Many smartphone had great technologies that were simply good ideas that were simply limited by manufacturing capabilities and other things. Also what you said can easily be said about Apple since everything Apple has ever done was either bought or copied from someone else. Even in the very few unbiased articles PA has, you guys always come and ruin it trying to credit Apple with some BS they don't deserve. Please name one cutting edge thing Apple did that no other OEM ever did on any level. Taking an idea done 10nyears ago and doing it better because manufacturing and engineering makes it more possible doesn't mean, they are the leader. Fingerprint readers, force touch, high density displays and more all existed prior to Apple just to name a few. They simply brought alternative methods to accomplish a similar task. I never said there would be no competition. Hopefully Windows will have blossomed by then and will have an abundance of apps, and maybe some other OS or Android fork will be out and be a major competitor. Give us the sony nexus with sd 820!!! The Dream!! Hey Chris, I get why you deleted the comments from before about poll 6, but seriously there's a typo: the Galaxy S is the one with 1%, not the Galaxy S5. Also, there are 8 polls in that album, not 15. With the first I am surprise Apple didn't get more than 11% of the vote considering all the fans here. Did the writers vote too? With the version of OSS was your first smartphone, I think tells how young through crowd is here. Most of the people my age would have seem to have vote for Windows Mobile if they were from the USA. Even though I tried Symbian, I never owned a phone with one. With the which Samsung design is the best, it's no surprise the S6 took the most votes. But even though the S5 got no love, it actually is the best design for lots of reasons. When compared to any of the S models, the dimpled back cover made the phone far less slippery to hold especially compares to the latest models. Also it's the only Samsung to be IP67 rated against dust and water. By the votes touch can tell most of the votes was solely based on looks. There is more to design than looks which shows most here are purely superficial. Based on the present Nexus model, I rather Sony or Samsung make the next Nexus. For 2016 I hope phone give us all really cool things to vote for other than looks, ui, camera or speed. Before the year is over do an article where different manufacturers introduced a similar feature in a different way and see how it gets voted.